From Northern Visions NvTv, Belfast. 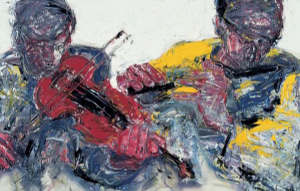 Painter and musician J B Vallely talks about his life and work as one of Northern Ireland’s most respected and productive artists. Born in Armagh, J B Vallely was painting from an early age and by the time he was thirty was regarded as one of the most exciting Irish painters. He talks to Northern Visions about his love of music, his recent one man show celebrating 50 years of his work and his fondness for Armagh “There is something about Armagh… I couldn’t live anywhere else”.